Welcome to Fun at Home Games! 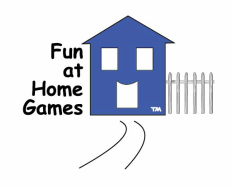 Home of Swashbuckled, ​Swashbuckled - Cut Throat, Lucky Number Football, and a growing number of other educational, entertaining, and remarkable table board games. We are in the business of producing quality games that encourage conversation, fun, learning and meaningful exchange of thought and feeling at home and among friends. Bring your family and friends together and play! "My son played it at his youth group at church at a 'games night.' He came home raving about it." "Our grandson told us he played it at a party and loved it."